As with any new industry that catches the interest of the general public, there are often a lot of repetitive questions and topics that come up in the news, on panels, and in conversation. Having spent a fair amount of time reading, learning, and writing, and a little bit of time investing in the autonomous vehicle space, I’ve gotten to hear many POVs on most major topics. What follows are some of the most talked about topics, potential stances/sides/discussions that are had on these topics, as well as some further reading to help you learn more. Think of this as an Autonomous Vehicle FAQ. I’ll try my best to keep it continually updated over time and please don’t hesitate to reach out on twitter or via email with any other thoughts, comments, or questions. Context: When do we have fully autonomous vehicles on the road? A) Many say 2020–2025 because every OEM, tech journalist, and thought leader has said that time. In practice, if you look at adoption of new technologies over time within auto, as well as how regulations are moving, this “a few years out” timeline makes sense, but a lot is based on self-imposed deadlines from major automakers. B) Much longer than we think. Until we can get autonomy magnitudes more perfect than human drivers are, it won’t be mainstream, because the public won’t be able to accept computers crashing and killing drivers at nearly the same rate that humans do. Further Reading:Forecasts, Autonomous vehicle implementation predictions, Why driverless cars will screech to a halt, A self-driving vehicle in every driveway but when? 2. How Does This Change Car Ownership? Context: If cars can drive themselves all around, how does ownership change? A) UberPool model. 96%+ of the time vehicles sit unused today. Vehicles will change from owned assets to leased assets. It becomes a race to $/mile charged and the majority of people will just utilize UberPool type rideshare programs where they call a vehicle that is on a continuous trip. Whether or not the ride is actually shared with others is inconsequential. Some of the wealthier people will own their own, single-family AV. B) Car ownership won’t fundamentally go away because people like owning their own cars (status symbol?) and things like suburban infrastructure + commute times will make it so that people will want their own cars to be on their perfect schedule and to service their family. Also, people love driving. C) All of these ownership model changes also could mean big problems for OEMs. Light vehicle sales could fall 40% while newer players like Tesla, Faraday Future, Zoox, and more could emerge and massively disrupt the incumbents. In addition, OEMs might not be able to move from being hardware companies to a combination of hardware/software companies. Massive consolidation will occur with many OEMs dying a slow death. 3. How Does This Change Cities? Context: Autonomous vehicles are going to have different infrastructure requirements than those with drivers in major metropolitan areas. A) Infrastructure will be great! Parking lots could move to outskirts of a city or even not need to exist as people’s vehicles will “work for them” a la Tesla Master Plan Part Deux. There’s a massive problem with this as it doesn’t fix for cleanliness and on-demand readiness (if I want my Tesla in the spur of the moment but it is driving someone across town, I’m going to be upset). Context: Who is the vehicle loyal to, society or the “owner”? 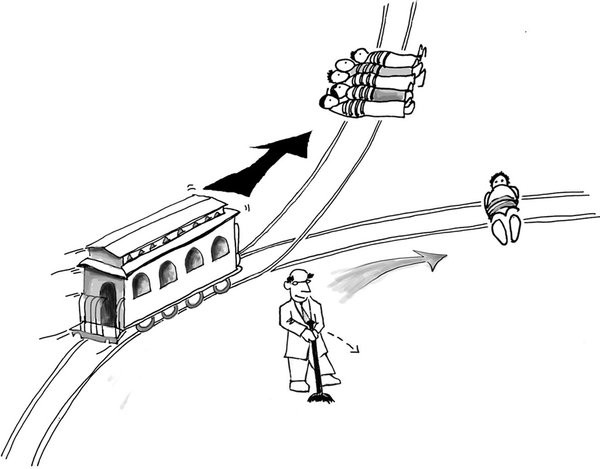 The trolley problem depicts this as a situation in which a vehicle must choose between two certain deaths. The car is skidding towards a group of children and has to make the decision to either kill the children, or course correct and kill the driver. A) Car should continue on path and let nature take its course. B) Car should optimize for minimal societal damage. Goodbye driver. C) Punt on the question entirely. Will vehicles even operate at this level of understanding in the near-term? 5. Who is responsible and what do we do about insurance? Context: With no drivers, somebody will have to be responsible for the actions of cars. A) The OEMs/service providers — Volvo and others have come out and saidthey will take full responsibility of their vehicle. Other OEMs should too. Maybe they even take over insurance pending regulations. B) The Consumers at a micro level— Insurance could be on a per trip to the user or a per vehicle to the service provider. C) New insurance providers arise with very specific products for AVs. 6. Will it be illegal to drive in the future? Context: Humans are simply not as good drivers as computers. Would it benefit society as a whole if it were illegal for us to drive? A) It should be based on the facts that human drivers are significantly more dangerous. 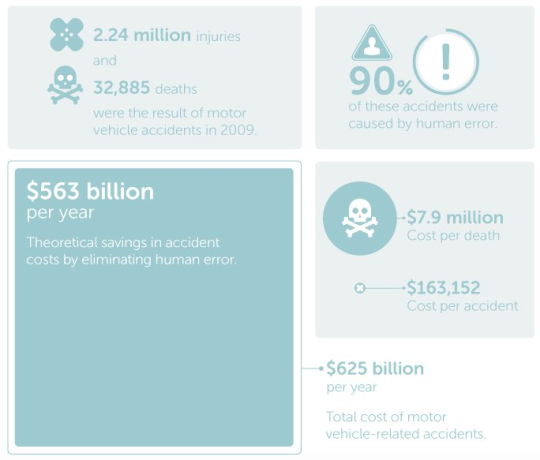 How does our perfect world of autonomous vehicles work if there are random data points of bad human drivers. Almost an “only as strong as your weakest link” situation. B) Humans view driving as a right. In no near future will it be illegal to drive. The lifecycle of cars can last years, and it’s not fair or practical to assume that all old vehicles won’t be able to be on the road. With that said, modifications could be required a la seatbelts being required in all cars today. 7. What about all the jobs? Context: With all of this automation, will the millions employed as professional drivers become unemployed? What happens to the jobs? B) Basic income. Similar to point A, but free up people to work on different problems. Context: Tesla was the first player to have some sort of autonomy in the market, has recently released its Master Plan Part Deux, and is the leading new-school OEM disrupting incumbents. A) Elon wins BIG. Tesla has a massive advantage over any other player due to deep technological expertise on both hardware and software stack,Gigafactory, and ability to capture more data around driver behavior than any other company in the world. The company caters to 100% of the future ownership model market but selling its vehicles to service providers, selling direct to consumers who still want to own their own vehicle, and also to the in-between class that wants to own but make $ by turning their under-utilized asset into a ridesharing vehicle. In addition, the move into public transit vehicles + utility vehicles allows them to penetrate markets that may take longer (or shorter) to reach mass adoption of AVs. B) Let’s take another look at that master plan. Tesla’s deep technological expertise has been partially based on a third-party provider in Mobileye (which they just severed ties with) and has been very stubborn around putting expensive LiDARs in their cars, which many believe are necessary for full autonomy in the near-future. If low-cost LiDARS like Quanergy, Innoviz,TriLumina, or others don’t make it to market as promised, and Tesla isn’t able to develop their own, they could be in a precarious situation in getting to market first. Especially if their cars keep crashing. But they have all of that data? It turns out that the majority of the data that Tesla gathers across those millions of miles isn’t actually as valuable as many believe. They log images every few frames and save video data/multiple frames only during accidents/failures. So maybe that data moat isn’t as big of a head start as many think. And loaning out your $30K+ asset to strangers? Sure vehicles are under-utilized but you pay for the convenience of being able to use your car instantly, which could be a problem if it’s across town. Also, who is going to pay to have your car cleaned? Will the extra money made by the average person drastically outweigh the depreciation and maintenance of your asset? Context: Uber is one of the most polarizing private companies in the world with a known desire to move to an autonomous vehicle-centric model. There are a lot of questions surrounding what happens to them when driver supply is no longer a constraint. A) Uber wins. Uber has built the pre-eminent ridesharing brand and will be able to roll out an autonomous fleet for monetization faster than most. They are already mapping, have bought vehicles, and have some of the brightest minds in AVs working on this. They can turn on/off autonomy for data gathering purposes based on road conditions (perhaps only during the day when its somewhat cloudy in suburbs to start) and they will still be able to monetize this autonomy. Uber understands how cities ebb and flow better than any other company in the world and that data will be invaluable for fleet optimization as they potentially move to an asset-heavy model. B) Supply-chain dynamics kill Uber. Brand loyalty doesn’t exist in the sharing economy and OEMs (like GM/Lyft) can optimize vehicles and vehicle prices for the new ownership models. An OEM can go from selling a car at an LTV of $50,000 to leasing it/utilizing it for an LTV of $100,000+. The software approach to auto will proliferate from Tesla to all existing OEMs (though consolidation will happen) and will make OEMs more bulletproof to disruption. If the ultimate metric is $/mile, owning the entire vehicle stack wins, and Uber does not own the vehicle manufacturing. Is the car the next screen? It started with TVs, expanded to computers, then to phones, and the next screen will be the car. Everyone continues to talk about how we are going to be freed up with an extra 40 minutes per day during our commute to consume content, view ads, and do anything else our heart desires in our autonomous vehicles. This could impact everyone from Netflix to Google (see more below) and even to companies like McDonalds which won’t be able to entice a robot to pull off the highway on road trips to go eat at their restaurants. Google has had large talent attrition recently and has made strong statements surrounding the difficulty of manufacturing its own vehicles. It seems increasingly likely that they could partner with an OEM (potentially acquire one?) and control the software stack in order to create an Uber/Lyft competitor. Another alternative is that they build out the vehicle OS, take advantage of the “cars are the next screen” narrative, and monetize with ads. Startups likePolysync are positioned to fight this battle. Apple has lost major people within their stealthy car team. They most recently were rumored to be moving away from creating their own car and instead are focusing on the software side. Unclear what that means yet, however it is a strange move for the most powerful hardware company in the world.